Our state of the art facility can handle all types of Denture Repairs and Relines. Over the course of the life of your dentures, you may encounter scenarios that may cause your dentures to crack or fracture. At our clinic, we help you make an informed decision on whether or not a denture repair makes sense. When we think a repair or reline is the right option for you, we’ll start your repair and often times complete it on the same day! One of the most common repairs is for hairline cracks located in the midline of the denture. These cracks are a strong indication that your dentures may be worn out. When this happens, we recommend a check-up with one of our denturists. Following your appointment, we’ll be better able determine whether or not a new denture is required. 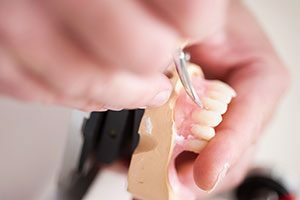 If a repair is not in your best interest, we can go over your dental options and find a solution that works best for you. Do you have damaged dentures? Give us a call Directly at: 250-595-1665 or email us today to book your appointment.